This deeply relaxing strain has an interesting story, still shrouded in mystery. It hails from sunny Florida and was created from experimentation going on in secret, as marijuana is still illegal there. The cities of Miami, Tampa, and Jacksonville played a big part, so the strain is sometimes called Triangle, as its origin cities recall the Emerald Triangle of California. It is also called The White for its beautiful coat of THC packed, sticky, trichomes. The White Strain medicinal cannabis is relaxing and has high THC levels. It can help with pain, mood disorders, insomnia, and everyday stress. Indoor/Outdoor Yield Growing outdoors in a sunny environment, it can yield 10 ounces per plant. The White Strain marijuana can be grown inside, such as in a grow room, a tent, or a greenhouse. Indoors, The White Strain will yield 10 ounces per square meter. Flowering time The White Strain buds will flower indoors in 8 – 9 weeks. Harvest The White Strain weed plants will be ready for harvesting outside in the of the month October in the United States. Disease resistance The White Strain is a descendant of a Florida Kush. With Kush genetics, we can compare it to the famous OG Kush and its legendary resistance to bacteria, mites, and other threats. Plant Height The White Strain cannabis plants will grow to a tall height, about 6.5 feet. Adverse effects With Kush and Indica genetics, you can expect this plant can produce some dryness of the mouth. It is less susceptible to causing panic due to its relaxing effects. To avoid these pitfalls, plant in an area with healthy soil and environmental parameters. Growing difficulty The White marijuana will require a high degree of care and skill. Because marijuana is still largely illegal and had been illegal in Florida during the development of this strain, information about its origins is shrouded in mystery and uncertainty. It was apparently developed over time from strains grown secretly in Miami, Tampa, and Jacksonville. Therefore, this area recalled the Emerald Triangle of California so the strain was originally called Triangle. However, due to the heavy blanket of trichomes being the identifying characteristic of the strain, people started asking for ‘The White’. 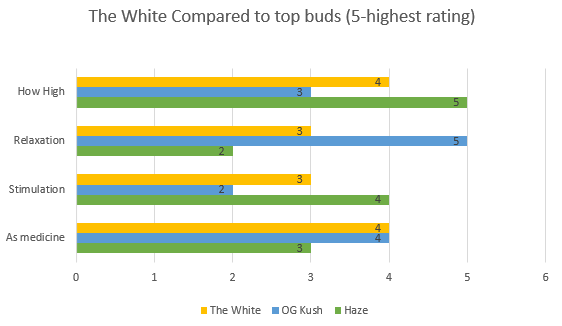 The white has medium, compact, Indica buds, absolutely dipped in trichomes. The plant is tall, standing at about 6.5 feet. The dried nuggets are compact with dark green and light green grains, surrounded by bright orange trichomes, and drenched in a sticky white coat of semi-solid THC called trichomes. It is notable for not having a strong smell. This is possibly because it needed to be kept secret, so a loud smell would attract unwanted attention from authorities. Once you light it up though, you will get a hit of strong pine-needles, and lemony zest. It will go straight to the brain. Growing weed from The White Strain cannabis seeds or cuttings requires a high growing ability. More specifically, it is clone only. You will have a hard time getting your hands on a cutting if you don’t live in the area of origin. It is also still illegal in the Florida Triangle from which it hails, so growers aren’t quick to sell a clone, just so that someone else can make the profits that he is missing. If you get your hands on a clone, you’re ready to go. You can do this indoors. Get out your 5 gallon flower pots and your favorite organic soil, fertilizer, or nutrient mix. Set up your tent or greenhouse and try to mimic that perfect Florida temperature. Plenty of sunlight, but not too hot or wet. Control the humidity with a humidity meter, a fan and exhaust system to circulate the air, and even a filter so that molds and mildews don’t get free transport to your plants. Make sure your tent has reflective lining. You will need considerable space to grow these plants tall, so make sure you have the room. Now set up your high discharge lamps. You will have to top off the plants to get them to grow tall and make sure all of the leaves get maximum sunlight. After about nine weeks, you can induce these plants to flower with a light cycle of 12 light and 12 hours dark. Now you are ready to trim them stems into bundles to hang and dry. Next, you nuggetize your white gold and store them responsibly. They are classically stored in dark out mason jars. Now some people use fancy systems like a Cannador with CVaults. In any case, keep the humidity and temperature at optimal levels and your weed will last. You will get about 10 ounces per square meter of space, but it’s packed with trichomes and there is high demand in Florida for the strain. Growing outdoors, you want a sunny climate like in Florida so find a spot with great soil, fewer pests, good sun exposure, and clandestine. You don’t want to do this in a state where it is illegal, but even in states where it is legal, be discreet. This weed will not attract attention, as the smell is mild recall. Your plants will flower in October and you will get a yield of about ten ounces for every plant you harvest. 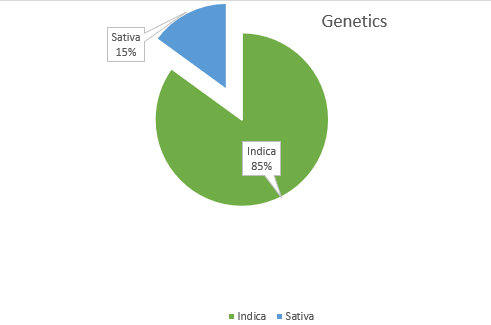 The White Strain is a 15 percent Sativa and 85 percent Indica with up to 26 percent THC. It has been used to improve symptoms in Spinal Cord Injury. An early study done in 1982, published in the Archives of Physical Medicine and Rehabilitation, which examined the effects of cannabis on spasticity first found a correlation between marijuana use and spinal cord injury. Those who used marijuana reported less spasticity and a better quality of life. At this time, it was still very difficult to do studies on cannabis due to the illegality (J, Rf and Jj). A study published in the Topics in Spinal Cord Injury Rehabilitation in 2016 demonstrated how far the states of the USA have come. It found that 92 % of the observational study participants lived in states which now allow medical marijuana. It is used by people with spinal cord injury to relieve both pain and spasticity (Drossel, Forchheimer and Meade). Spinal Cord Injury is usually caused by some kind of physical accident such as a car accident, fall, or shooting. The spinal cord supplies nerves through out the body and it is the information traffic hub connecting the body to the brain. When there is an injury, there can be chronic pain, loss of sensation, and spasticity, trouble moving when the communication between nerves and muscles are not strong. You feel like your legs are jelly or the muscles are permanently contracted. It can make locomotion difficult. Spinal Cord Injury patients noticed early on that spasticity and shaking could sometimes be stopped by smoking marijuana. Though this had been noted in the 70s and 80, the knowledge had gone underground as the government cracked down on drug use. During the resurgence of interest in the 2000s, it was rediscovered and now spinal cord injury is one of the frequent indications for the use of cannabis. It appears to help mostly with spasticity and pain. 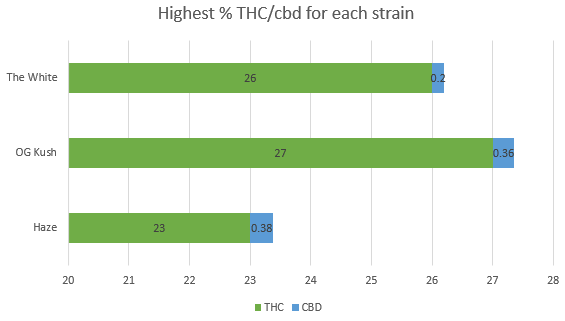 THC levels reach 26 % so this is a heavy duty strain. Beginners beware. This strain will need to be smoked slowly. Puff puff, give. Share. The strain goes straight to the head and fills it with pleasure, warmth, and euphoria. Your body goes in and out of consciousness and may be locked to the couch, but it’s fine because you feel great. You will be better able to bond with friends and family and share how you feel about things. Drossel, Claudia, Martin Forchheimer и Michelle A. Meade. «Characteristics of individuals with spinal cord injury who use cannabis for therapeutic purposes.» Topics in Spinal Cord Injury Rehabilitation 22.1 (2016): 3-12. 14 3 2019 г. http://archive.scijournal.com/doi/abs/10.1310/sci2201-3. J, Malec, Harvey Rf и Cayner Jj. «Cannabis effect on spasticity in spinal cord injury.» Archives of Physical Medicine and Rehabilitation 63.3 (1982): 116-118. 14 3 2019 г. https://ncbi.nlm.nih.gov/pubmed/6978699.